If I were to make a scarecrow and choose to use a thick branch (e.g. 1.5") for the vertical pole of the cross, any tips on getting scarecrow to stand? I had the idea of inserting the branch into a couple foot section of 2" PVC. Then I would either build a base for the PVC (concrete block or wood), or perhaps I could just slide the PVC onto some rebar (assuming there is enough room). For the record, this is going on my front lawn so I'm reluctant to use a fence post digger, but I may employ some bales of hay to obscure some of the base. I used a 6' T post driven into the ground half way, then just screw into the branch, my scarecrow stands about 10' tall and weights a good 40lbs, no problems. 1. I have no yard to install my displays so I typically have to build plywood bases. Depending on height/weight of the post you can use wood deck screws (at least 3 1/2") if the post is 6'-0" or shorter and weights around 30lbs or less. If taller or heavier than use a lag bolt. Either way pre-drill thru the bottom and attach to plywood base. 2. 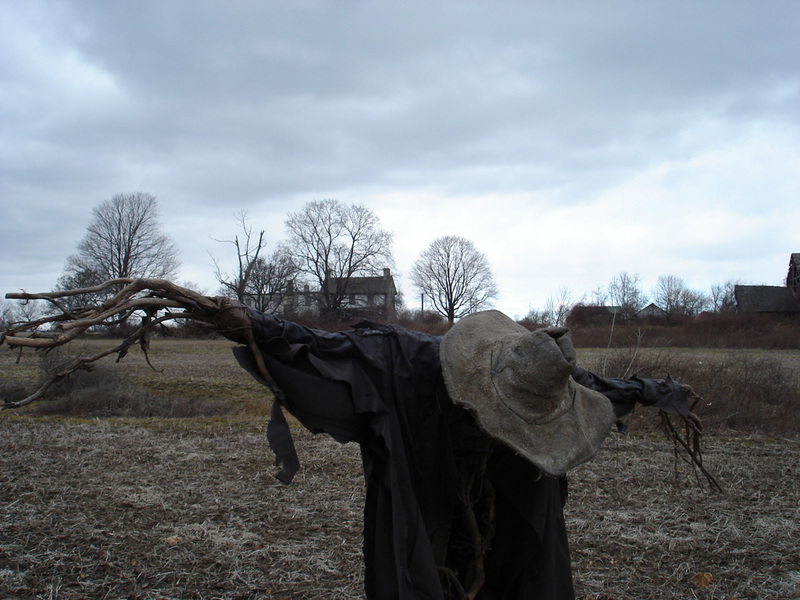 Rot typically uses a wood or steel post inserted into the ground for most of his scarecrow props. However on Appleseed he used interwoven limbs (I believe from a crepe myrtle) for both the support post and the arms. You can use wood screws to attach the arms to the post and then tie with jute rope to achieve the same appearance. I took an old board 3/4" x 3" and screwed that to a 2x2 to form a strong "frame" that provided the structure to mount the branches and PVC arms to. I painted the 2x2 black - in hindsight I probably should have painted the board black as well. Then I took a large branch and screwed it to the front of the frame so it appears that it is at least partially made out of actual branches. At night with lights on it all you really see is the texture of the branch so it works. To hold it up I pounded a piece of 6' x 1/2" rebar into the ground and used zip ties to attach it to the back of the frame. I actually have a pumpkin sentinel in the works, but I'm going to mount it on a flag pole holder to tree, so no worries about a stand. I'm trying to figure out by your photo: what is the pumpkin mounted on -- seems something wider than just PVC. And what did you use to make and secure the long stem? I have since completely redone the arms with larger PVC pipes and created actual hands rather than just using sticks. Because we use them out in the garden for our berries, we recommend using a simple metal fence post. You can get a six foot post for under five bucks at Home Depot or other home improvement stores. They're pretty easy to hammer into place and they hold up really well. Our berry plants have been growing for five years, and the posts are still holding up great. Just make your scarecrow and tie him to the post. I just put rebar into the ground, and then use PVC over that, then I tie several branches to it. JW Halloween - where did you get that jack-o-lantern head? Or did you make it? Looks great and I would love to build one. Sorry for the hijack. Regarding OP's question, I hammer rebar into the ground and put my pvc fencing on it. Pretty sturdy. Your scare crow may be top-heavy so go with 4ft or longer rebar if you try this. Mechanical: FCG on 10' pole or telescoping flag pole?